We’re still busy working on projects for the kitchen remodel. 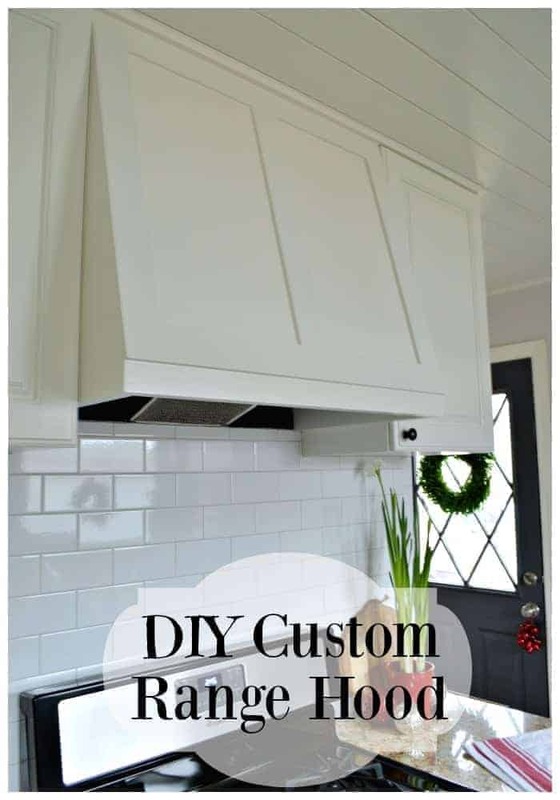 Since we finished the refrigerator cabinet, we’ve been putting all of our time and energy into our DIY custom range hood project. Let’s go back to January when we started this project. We have a really small galley kitchen and this, obviously, is the wall with the range. As you can see, we had a stainless steel range hood and I knew from the beginning that it was going to go. 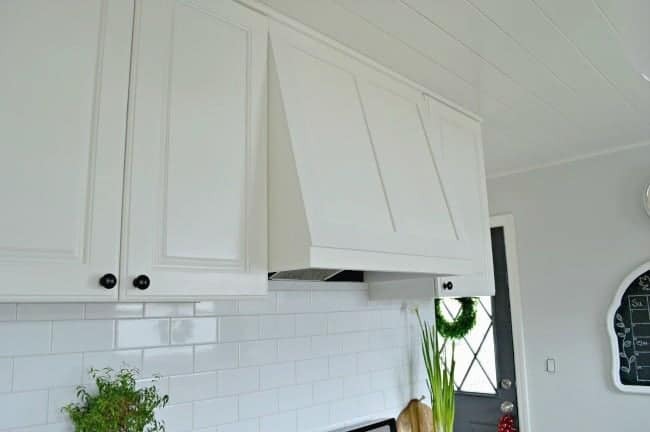 I wanted something custom that went with my newly painted white cabinets so the hubs worked his magic and took the old hood apart and used the guts to build a new one. You can read about how we built it here. This is what I shared with you in May, it was built and installed but not painted. I still wanted to add molding to it but we had a few issues to work out. The biggest issue was space or, should I say, lack of space. 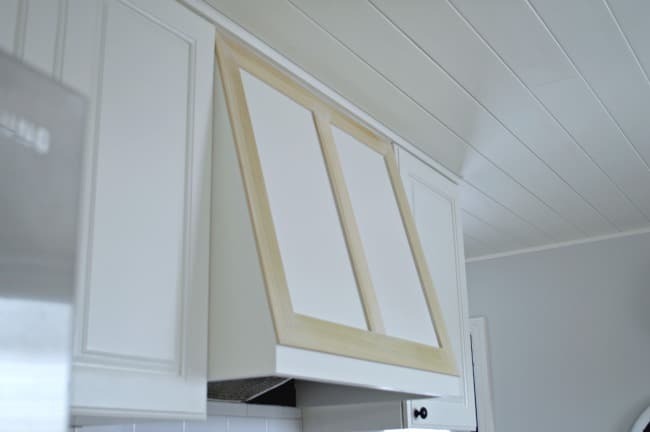 Because the cabinet doors are so close to the range hood, there was no extra room for any kind of molding on the side. 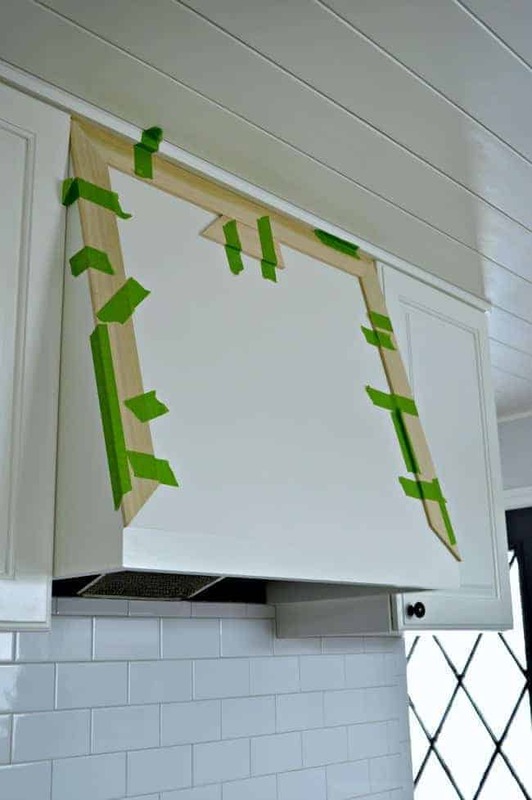 I was a bit disappointed but there was nothing to be done, so we I went with Plan B…put molding on the face of the range hood. Sounds easy, right? Well, convincing the hubs to do it took me almost 6 months. He wasn’t sure how we were going to attach the molding without drilling holes and using nails to secure it, which is something he didn’t want to do. Month after month I would nag him we would discuss it (I don’t give up easily). I would draw him pictures, share images I found on Pinterest and he still fought it. Finally, I went to Home Depot and just bought the wood myself. Once he saw what I wanted to use, he warmed up to the idea and the project continued. This is where we left off with the range hood painted and the cabinet doors back where they belong. So we ended up using thin poplar boards, instead of regular molding. 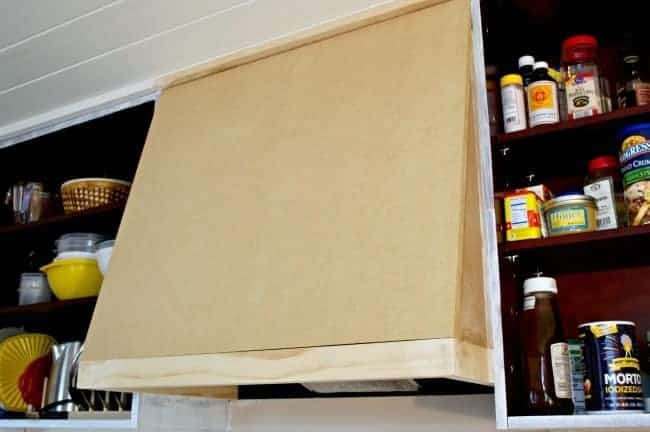 It’s lightweight and has smooth edges when it’s cut, unlike some less expensive wood boards. Best of all, we only paid about $12 for a couple of boards, bringing the grand total to just under $50 for the completed project. 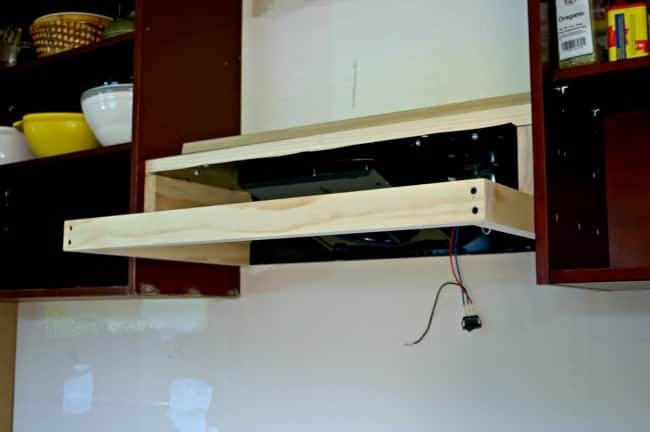 We kept it simple and framed the outside of the range hood with a plank going down the center. To glue the boards down we used caulk and then taped them up to keep everything in place. We did have a couple of corners pop up but the hubs just drilled a pilot hole and used a small nail to push it down. My job was to finish caulking all the cracks. Then I moved on to sanding the wood, priming and then painting it. 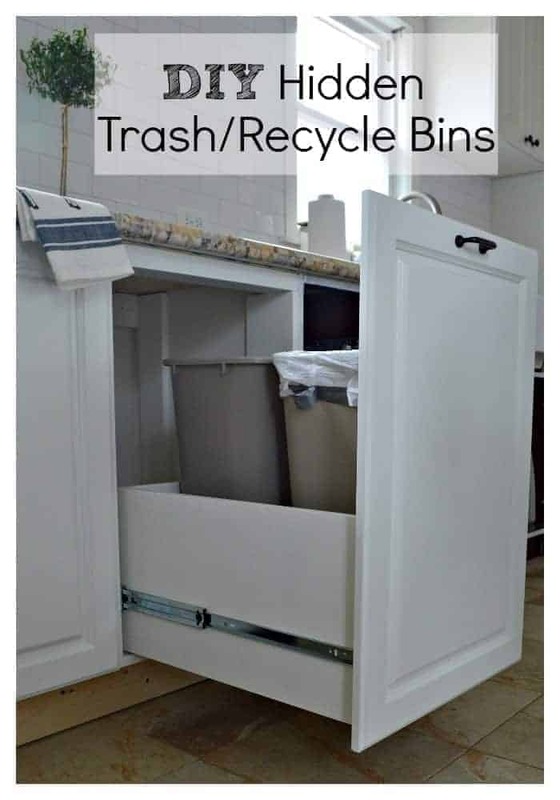 I know that it doesn’t have the same detail that the cabinet doors have, but I really love the simplicity. 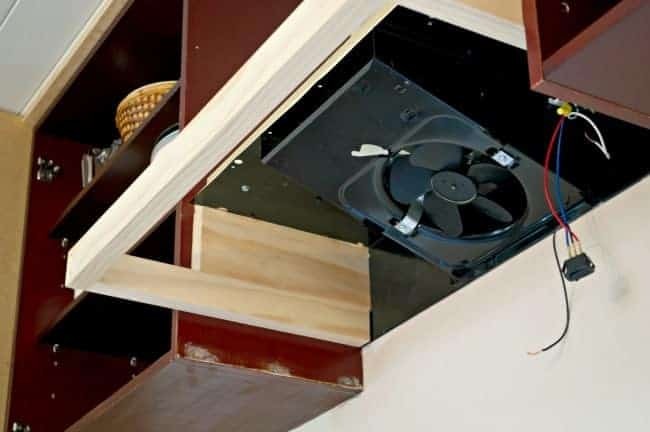 It’s just enough detail to give the range hood a little something extra. I also wanted to share a fun accomplishment for little, old Chatfield Court. 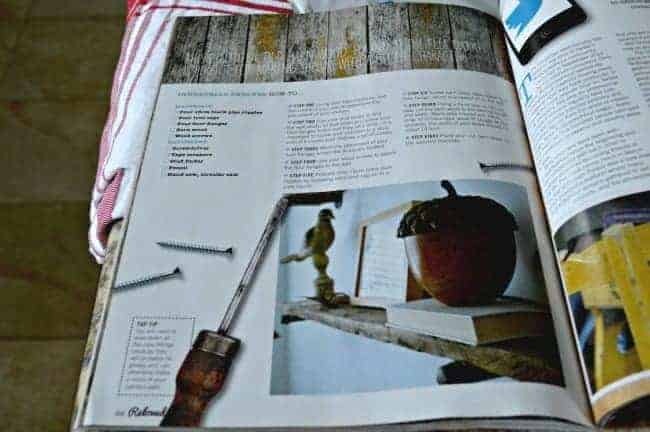 I wrote a tutorial for barn wood shelves for Reloved, a publication from the UK, and it was published in their December issue. 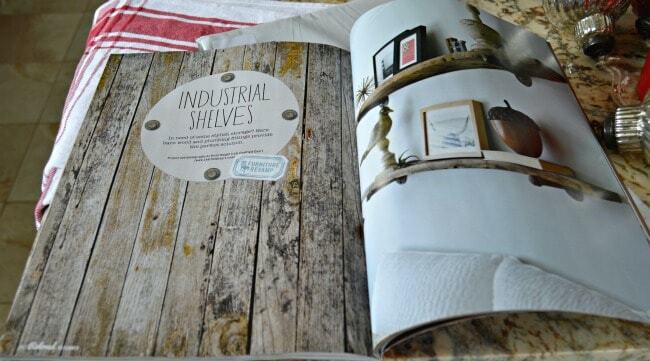 My barn wood shelves were on the cover, too! It was so fun to see my name and project in a magazine. Ok, enough fun. Time to get back to finishing up the kitchen remodel. Hope you have a great weekend! Here’s few other kitchen remodel projects we’ve finished. Thanks so much Kristin! I love it but I’m so looking forward to the day that we can say we’re done. 😉 I appreciate all of you ladies hosting your awesome party every week. I always enjoying visiting. 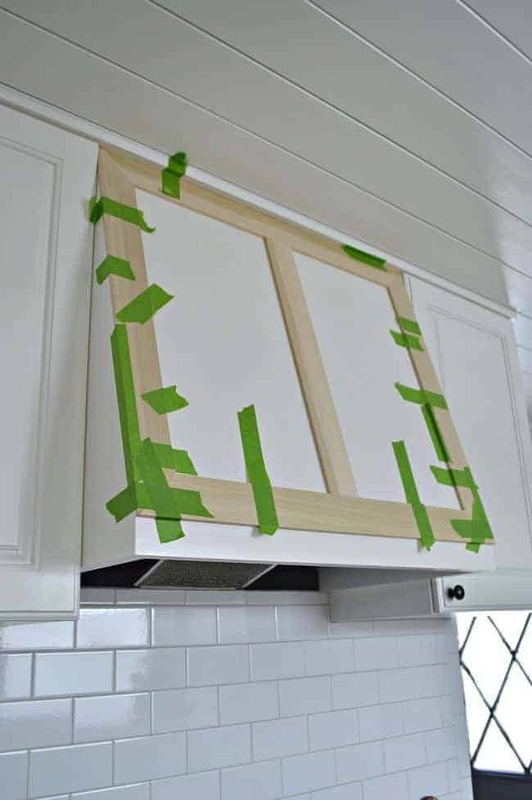 You and your husband did a wonderful job:) I think a pretty hood is one of the biggest factors in helping create a charming kitchen. My husband is not quite so handy, so I ordered a simple unfinished hood online along with a vent insert and stained the hood to match. 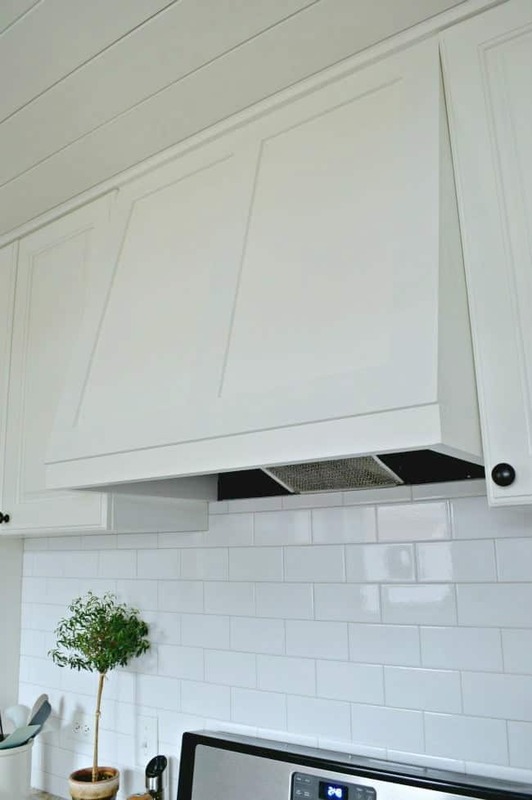 I posted a picture online in a forum to help answer a question, and someone wrote in concerned about the height of a wood hood above the stove – mine is 26 inches and apparently some areas have a code of 30 inches. I searched my state code and could find nothing – and also my kitchen predates the date that was given for the code. 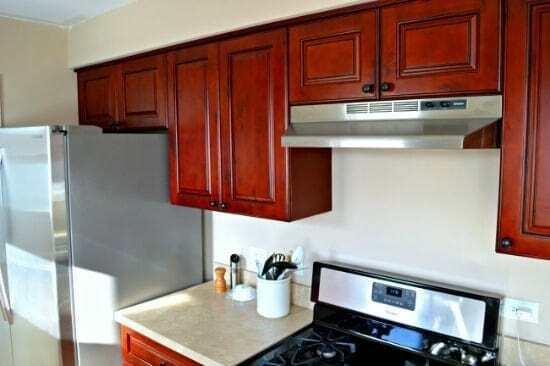 I also noticed several other hoods – at my friends’ houses and in kitchen displays – that were similar clearance as mine. I also live in the Midwest. I only write this to let others know to check the local code to determine how low a wooden hood can hang. 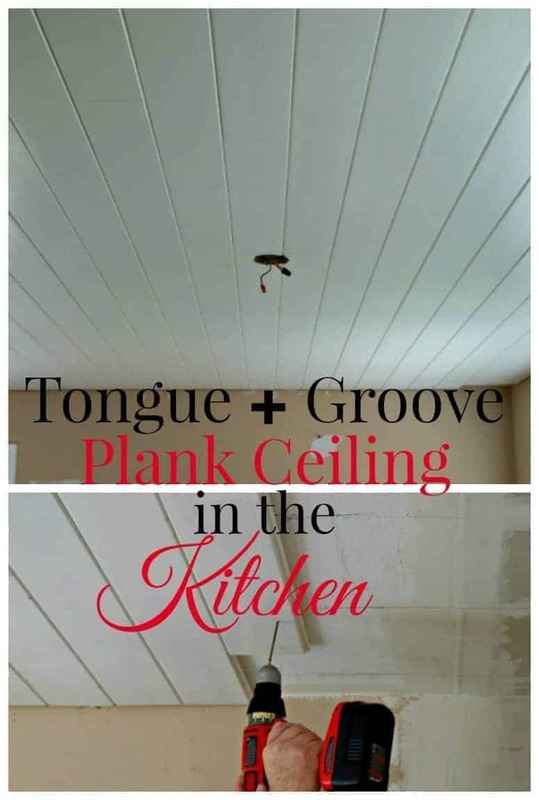 Yours looks like it is plenty high enough as it goes to the ceiling – an absolutely wonderful plank ceiling – also on my list of things to do. Thanks Jeanne. It’s been a lot of hard work, but it will be all good in the end. 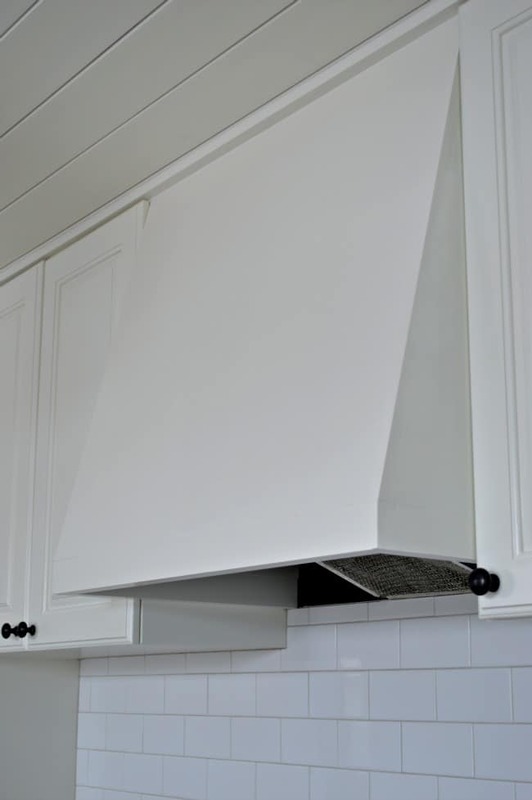 I appreciate you sharing about range hood height requirements. Fortunately, we considered this when we built it and made sure we went a bit above 30 inches. I know it’s tough in these older homes though. Ours was built in the 50’s and, unless we wanted to bump out walls, we had to stick with the 50’s layout which is not very user friendly. It’s definitely been a challenge. 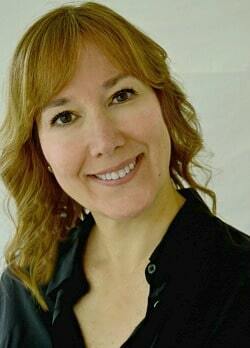 Thanks again Jeanne, I’m so glad you stopped in. Congrads on the magazine! Yes, the hood looks better with the molding. I like the way it compliments the cabinets. We’re still working on the bathroom. My son and his worker have been replacing a couple of pieces of sub-floor that were damaged and the sheet of plywood just went down today. Unfortunately my son and his family will be away this weekend so we have to wait until Monday for them to put the actual floor down. Right now the toilet is back in place and the sink cabinet is in there, but not hooked up (need to move it out again). I’m hoping this will be done by Christmas. (sigh) After this I think I’m going to take a break from remodeling for a few months. I need to get my house back in order and do some normal things for a change. Looks great, Kristi! I am a big hood, fan. It’s the favorite part of my kitchen, I know you’re going to love looking at yours. Congrats on the feature! 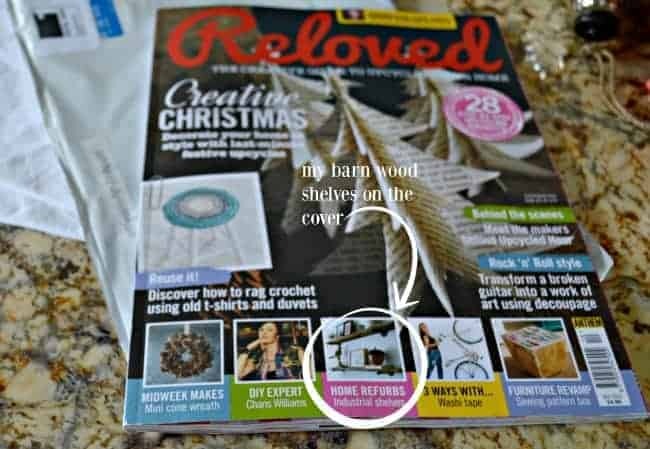 Reloved is a lovely magazine. Forgot to congratulate you too on the feature! WOW! Christmas truly came early for you dear! OMG, can’t believe this is a DIY, it is PERFECTION! Thanks Vel, I love how it turned out! Congrats on the magazine article *and* getting on the front page! That’s awesome! Thanks so much Debbie! He is quite the handyman and he always goes along with my crazy ideas. 😉 Happy weekend to you my friend! I just knew you were going to be famous! Congratulations on the article and the hood looks so professional. What a beautiful kitchen you have.